Now offering the reBounces SmartBuy Program on all Green Tennis Machines! Utilizing our patented, revolutionary technology, you can now restore dead tennis balls in bulk back to their original bounce in just a few days! 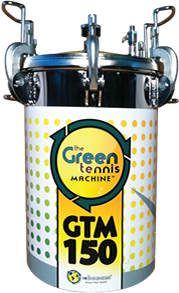 The Green Tennis Machine extends the life of your practice balls, improves ball consistency in your teaching baskets, helps by saving money on practice balls, and reduces the waste thrown in landfills.